SINGAPORE (July 23): Global enterprise software corporation SAP on Friday morning signed a memorandum of understanding (MoU) with Singapore’s five polytechnics and SkillsFuture Singapore (SSG) to launch SAP Skills University Singapore – an information and communications technology (ICT) focused tri-sector education programme led by SAP. The collaboration aims to train Singaporeans to take on ICT-related job roles by equipping them with critical skillsets in emerging technologies such as artificial intelligence (AI), data analytics and Internet of Things (IoT). It will also offer career advisory and placement services for ICT-related jobs, with funding support by SSG. In addition to receiving internationally-recognised SAP certificates, students of the SAP Skills University will also gain access to current and future SAP offerings including its Coaching & Mentoring Network, SAP Co-Innovation Network at Singapore’s recently-launched SAP Leonardo Centre, and coding boot camps. In its press release, SAP says the programmes offered by SAP Skills University will target to meet the manpower and skills needs of not only SAP, but also the broader industry, including SAP’s customers and partners. The organisation expects over a thousand individuals to benefit from the collaboration over the next three years. Ong Ye Kung (left), Minister for Education, was present at the MoU signing ceremony this morning as the guest of honour. Speaking at the event post the MoU signing, Ong says Singapore’s education system has successfully crossed two “bridges” – having the mindset and concept of lifelong education in place, as well as the ongoing cooperation and collaboration between institutes of higher learning (IHLs) and industries. “Today I hope is a starting of the crossing of a third bridge, which is the industry and companies training workers, training students, in a way that goes beyond your needs,” commented Ong. As part of the collaboration, two new work-learn programmes that combine placement and training will be made available. The first is a professional conversion programme which will be launched to target mid-career individuals in helping them gain new skills in into the ICT sector. Another programme will cater to fresh polytechnic graduates and facilitate employment opportunities with companies in the ICT. “With the SAP Skills University Singapore, we aim to facilitate education in the fields of advanced technology and complement the foundation that’s being taught in academic institutions with hands-on learning through SAP products and working experiences. 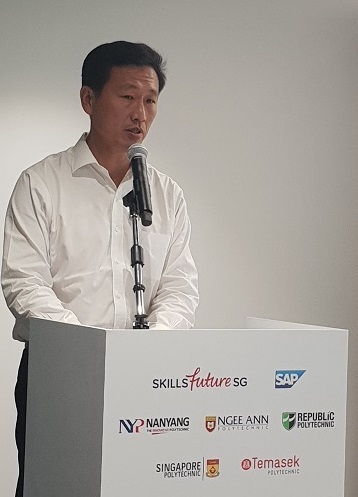 This is a crucial measure in closing the gap between the demand and supply for qualified Information and Communications Technology professionals,” said Khor Chern Chuen, Managing Director, SAP Singapore. “Through this partnership, SAP is committed to doing our utmost in helping young and mid-career professionals to stay productive and gainfully employed, and in helping our customers to stay competitive, in the face of digital disruptions,” he added.